Guess what Donald Trump is saying now? Last week, I discussed how Robert Kiyosaki and Harry Dent are warning that a major crisis is inevitable, but I didn’t expect Donald Trump to come out and say essentially the exact same thing. On Saturday, the Washington Post released a stunning interview with Donald Trump in which he boldly declared that we heading for a “very massive recession." He also warned that we are currently in “a financial bubble” and that “it’s a terrible time right now” to be investing in stocks. These are things that you may be accustomed to hearing on The Economic Collapse Blog, but to hear them from the frontrunner for the Republican nomination is another thing altogether. Because it distrusted the Labor Department’s unemployment statistics, the Federal Reserve — without any fanfare — started calculating its own jobless rate two years ago. And the Fed’s calculation, called the Labor Market Conditions Index, or LMCI, shows that the US unemployment rate in February was 5.8 percent. That’s much higher than the 4.9 percent official jobless rate reported by the Labor Department. Of course if truly honest numbers were being used, the unemployment rate would not be anywhere close to this range. According to John Williams of shadowstats.com, the broadest measure of unemployment is currently sitting at 22.9 percent. And just last week I showed my readers that 23.2 percent of all Americans in their prime working years do not have a job right now, and that inactivity rates for both men and women in the U.S. are currently far higher than they were during the last recession. So when Donald Trump says that we are at an unemployment number “that’s probably into the twenties," I would have to rate that statement as mostly true. Of course things are about to get a whole lot worse. According to Challenger, Gray & Christmas, job cut announcements by major firms were up 32 percent during the first quarter of 2016 compared to the first quarter of 2015. When big corporations are doing well, they tend to hire more people. But when their earnings start to go down, one of the very first things they tend to do is to lay people off. 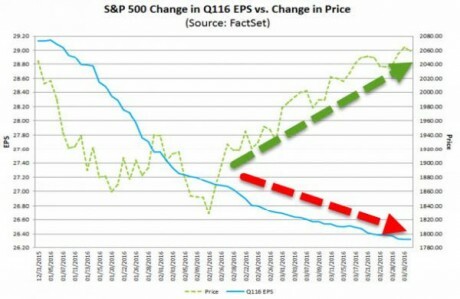 Even analysts who estimate pro-forma, ex-bad-items, non-GAAP earnings that S&P 500 companies propagate to look better and that these analysts use to inflate their stock-price targets, just threw in the towel on the quarter. They expect these inflated earnings per share for the first quarter to plunge 8.5% from a year ago, according to FactSet. If this holds after S&P 500 companies report their ex-bad-items earnings, it would be the worst EPS decline since Q3 2009. It would also be the fourth quarter in a row of year-over-year earnings declines, a phenomenon that last happened during the Great Recession from Q4 2008 through Q3 2009. Why can’t more people see this? For months, I have been pointing out to my readers how history is repeating. 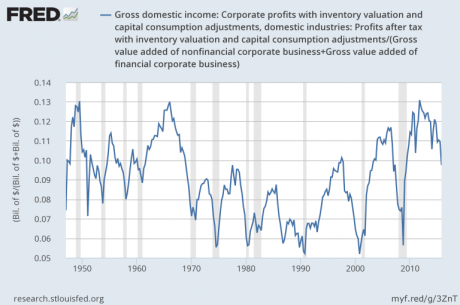 The exact same patterns that have happened just prior to previous recessions are happening again, but most people just refuse to see the truth. It is absolutely maddening, and it is just more evidence of how “dumbed-down” our society has become. So when Donald Trump says that we are in “a financial bubble” and that “it’s a terrible time right now” to be investing in stocks, I would have to rate those statements as absolutely true. I would also have to rate his statement that we are heading toward a “very massive recession” as absolutely true as well, and legendary investor Jim Rogers agrees with me. In fact, he recently told Bloomberg that there is “a 100 percent probability that the U.S. economy would be in a downturn within one year." The truth is that the U.S. economy has never even gotten close to recovering to the level it was at just prior to the last recession, and now the next major crisis is upon us. But this new crisis is not going to be like the last one. It is going to be much, much worse before it is all said and done, and what is coming is going to bring America to her knees. This is something that I discuss in my new book. The economic devastation that is coming is going to be unlike anything that any of us have ever known, and it is going to shake America to the very core. So enjoy the remaining days of “normal life in America” while you still can. A lot of people are using this time to party, but if you are wise you are using it to prepare. Next 50th Anniversary of Vietnam War: Have We Learned Nothing?